Some of you know I had a radio show for seven years, five of those broadcasting locally one hour a week from a studio where I discussed topics of psycho-emotional and spiritual interest with my lovely and engaging host Brenda Padilla, and two of those years I interviewed people I was interested in on my internet show called Rewiring the Soul (yes, the same name as my first book). At any rate, at some point I interviewed Mike Habernig and April Hannah about their then recently released documentary film: The Path: The Afterlife, and I am ever so thrilled to announce they have now come out with their new film, the topic of today's blog post: The Path: Beyond the Physical (the trailer is available at that link). This film's site indicates that it "investigates topics about life after death, out-of-body experiences, multiple-dimensions, remote viewing, consciousness and all the realms that fall beyond outside of our physical bodies. It focuses on ways in which humans can shift their consciousness in order to experience the non-physical aspects of our existence while living in the physical body." 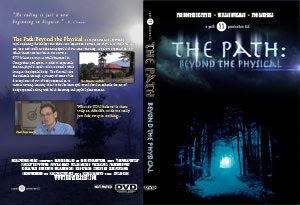 The film takes the viewer through a journey of some of the first explorers of out-of-body experiences like Robert Monroe, to the once classified military mission of remote viewing, while the experts in the film educate viewers about tools like hemi-sync music that can enhance the out-of-body experience. Paul Rademacher, former President and Executive Director of the Monroe Institute, an organization dedicated to the exploration of human consciousness, internationally known for its work with audio sound patterns that can have dramatic effects on states of consciousness, along with leading out-of-body expert William Buhlman, and NASA nuclear physicist, noted lecturer and explorer of consciousness Thomas Campbell participate in the documentary. Finally having been able to watch the video several days ago, I can't tell you how much I enjoyed it. I kept imagining that if I had never heard of the people who produced it, and had just now found it, even though it says little I don't already know, it is so very exciting to hear these topics spoken of seriously and with intention and furthermore, by people who have gone through the process. I particularly loved Tom Campbell's last longish monologue about how to get there (OBE's), how it's not really a question of ritual or tools, but one of moving yourself there and realizing you are there. It made me recall my first past life regressions late 1989 in Galisteo, NM at the Light Institute with Chris Griscom (I wish she could have been part of the film), and the fact that I also had certain 'expectations' about how that process had to go (as Tom Campbell refers to with respect to the manner in which many people think their OBE's should go) and hence could not see what was happening until I let go of those expectations and presto, there I was in those past lives. I also was very pleased to hear one of William Buhlman's final comments about OBE's being the portal for many to seek a deeper spiritual experience in their lives. I am confident that those who have not heard of OBE's or who perhaps continue to think that they are at best the wishful imagining, or at worst, the psychotic rambling of certain individuals will, thanks to this video, change their minds. Congratulations on a film not only well-made, but also on a message that needs to be spread much more broadly across our global community.